There’s a time and a place for boiling pans, sugar thermometers and endless beating with a wooden spoon. Forty eight hours before Christmas Day when you’re frantically trying to finish making and wrapping edible gifts for all your family and friends probably isn’t it. 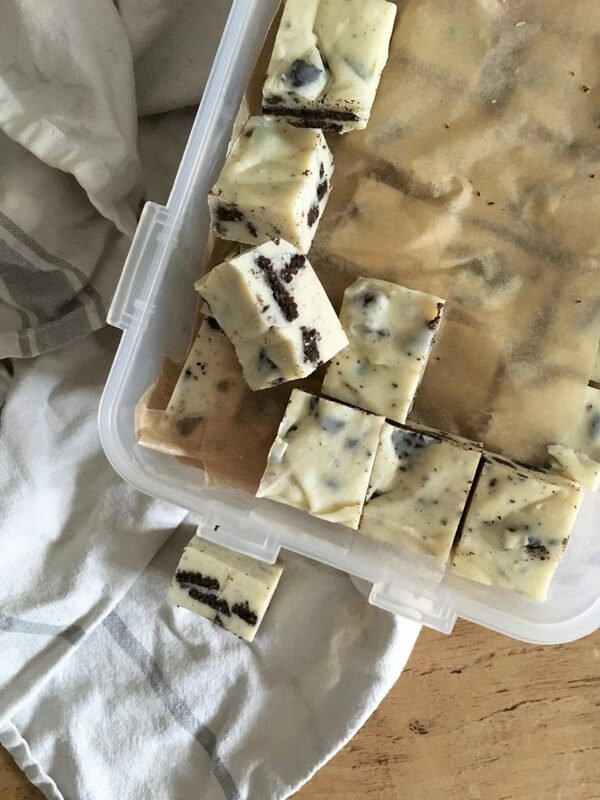 Throw a (not so) tiny ten month old explorer on the brink of walking into the equation and this 3-ingredient fudge was the elf to my slightly frantic Santa. 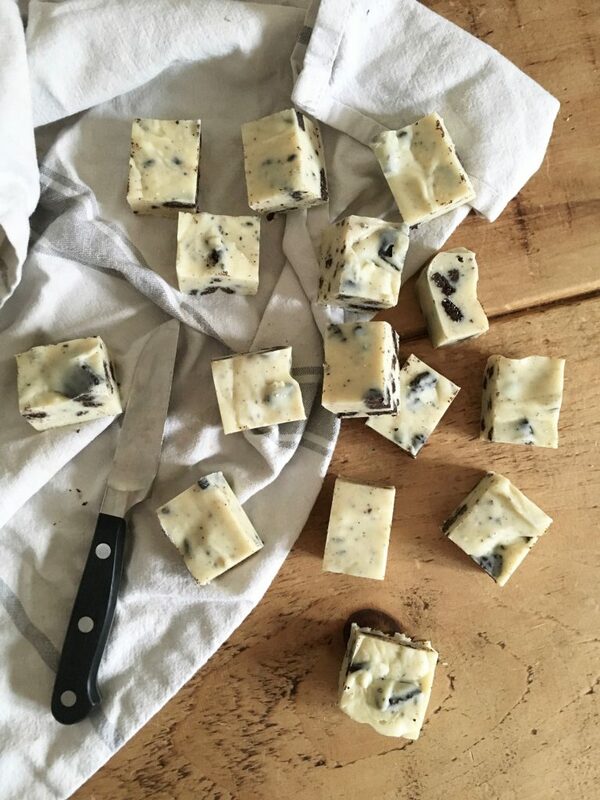 Some might call it ‘cheat’s’ fudge – you simply mix together melted chocolate, condensed milk and cookies – but when something tastes this delicious, who’s going to begrudge the odd shortcut? Christmas officially starts today in the Little Loaf household as we pack up our bags (multiple bags that is, a buggy, changing mat and nappies, a ton of toys, plug socket protectors, presents and enough fudge to feed an army) and head over to my parents’ house. I’m already dreaming about the mince pies my dad buys – yes, buys, I’m yet to try a homemade one as tasty and with such a generous ratio of pastry to filling (I’m basically only in the mince pie game for sweet shortcrust and cream) – and doing little happy dances every time I imagine our little boy’s face on his first Christmas morning. Is he too young to appreciate it? Possibly. But even if he spends all day shredding wrapping paper, attempting to eat every unsuitably small cracker toy and tugging down my mum’s Christmas tree, I’ve got a feeling it’s still going to be a pretty special day. After Christmas we’re off up to Yorkshire for more family time, so today I’m officially signing off for 2016. To say it’s been a real rollercoaster of a year is to put it mildly: brilliant and fulfilling, tough, terrifying, but above all oh so sweet. When things have been hard, it’s been such a joy to escape into the kitchen, to this space, to stir a bowl of ingredients or write a sentence and allow my thoughts to settle into place. Thank you all so much for stopping by, for your lovely comments and emails and for making blogging such an ongoing pleasure. I’ll see you in 2017: I have a feeling it’s going to be a good one. 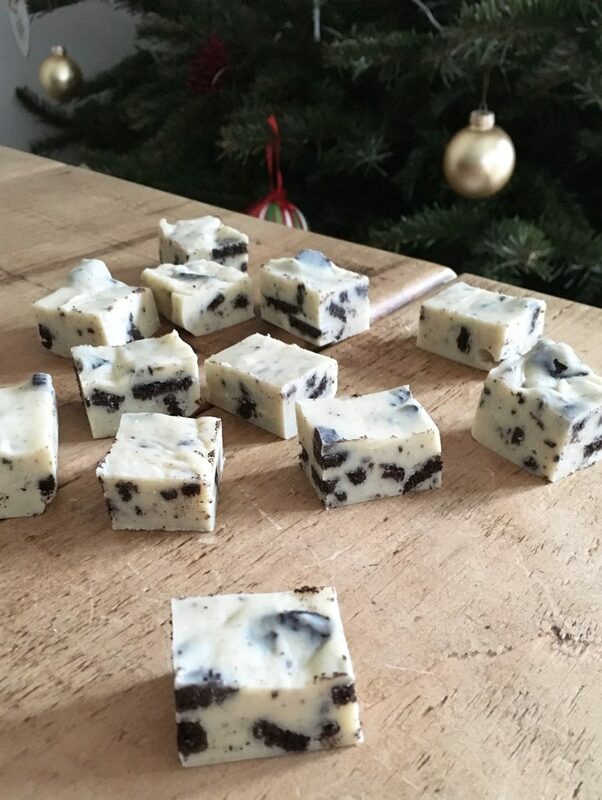 A simple, creamy 3-ingredient fudge made with white chocolate, condensed milk and crushed Oreos. Feel free to experiment with the cookies - ginger snaps and bourbons also work well - or throw in a few drops of peppermint oil or a handful of dried fruit and nuts for a festive twist. Line a 23cm square baking tin with parchment paper. In a large heatproof bowl suspended over a pan of simmering water, melt together the white chocolate and condensed milk until smooth. Stir in the crushed cookies then scrape into your prepared tin and smooth the surface with a spatula. 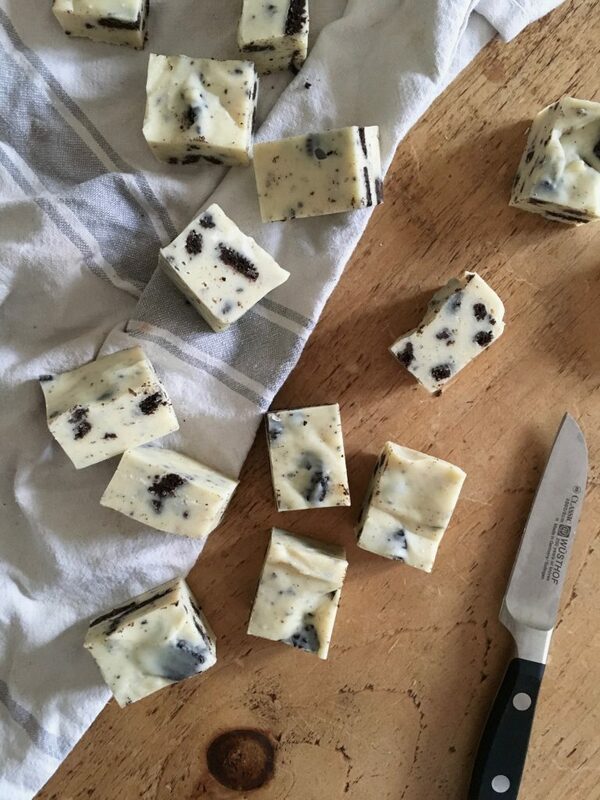 Refrigerate until firm, around 2 hours, then cut into small squares. Wrap individually in wax paper, if you like. 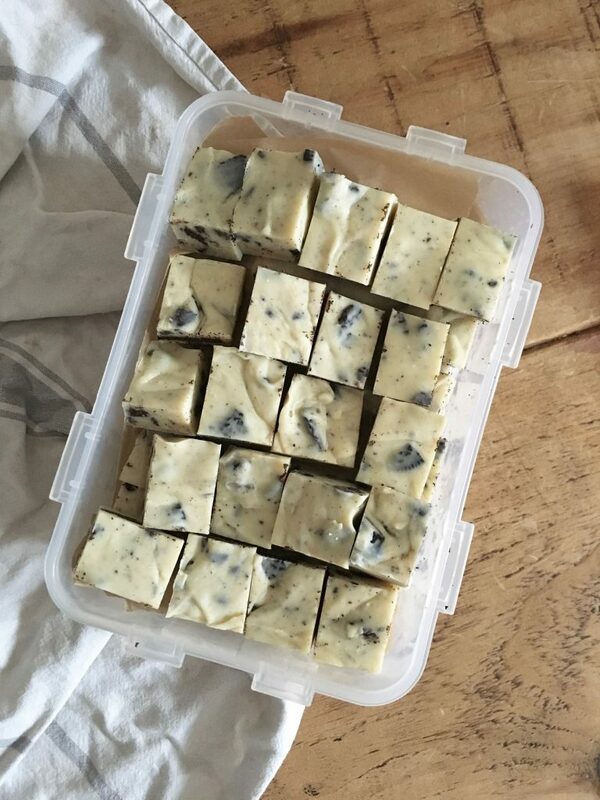 Fudge will keep in the fridge for several weeks. Hi Kate. 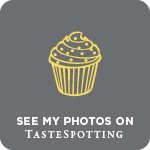 Just wanted to say thank you once again for creating and sharing this beautiful blog. Your intense, unfailing gratitude for and appreciation of the blessings in your life is a continual inspiration to me. May 2017 continue to be filled with joy and love for you and your family – and may the terror you’ve been through be left far behind. Merry Christmas to you all! Great recipe, so simple and so so tasty – hard to leave alone! Wow that looks so yummy! Need to make these! Thanks for the recipe.